While exercise is great for your body, failing to take care of your skin before and after workouts can cause breakouts, clogged pores and irritation. Thankfully there are simple and easy steps to take before, during and after your workout to keep your skin looking just as great as you feel after a killer workout. 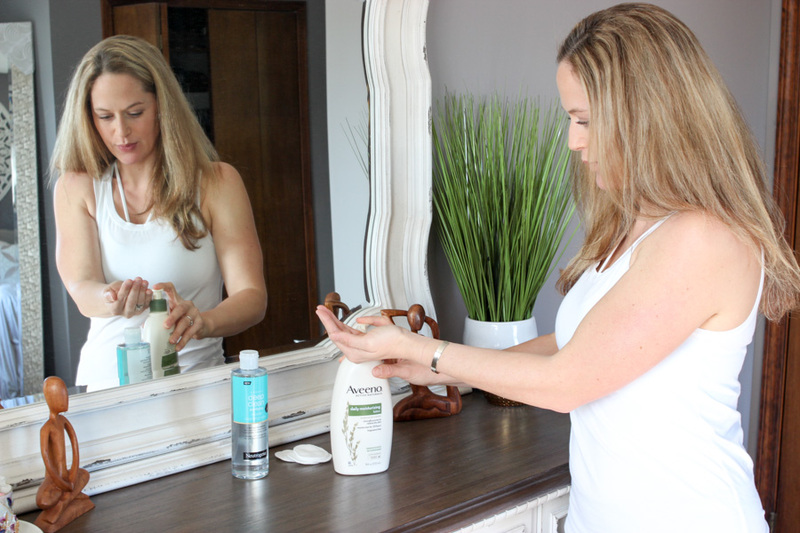 Taking just a few minutes to prep and pamper your skin when working out can make a huge difference when it comes to the health and condition of your skin. Adding skin care to your workout routine means you’re always ready to put your best face forward! 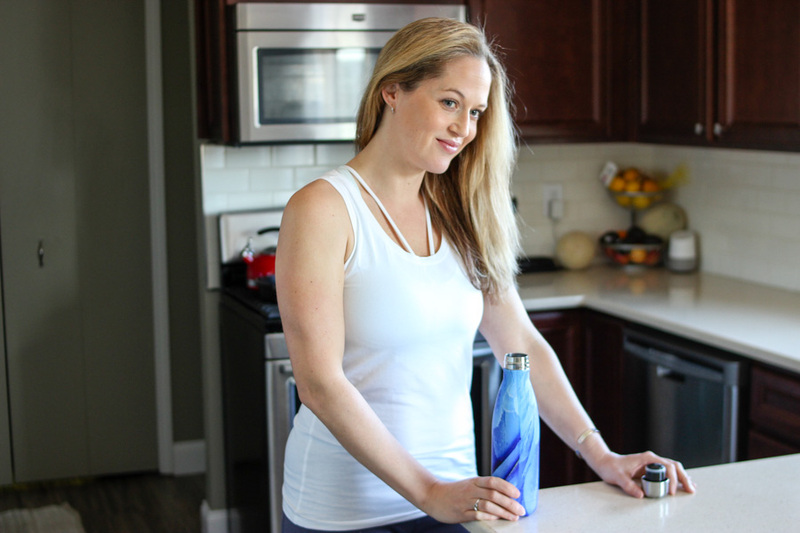 I’ve rounded up a few no-sweat tips to add to your post-workout routine to keep your skin looking fabulous. Before you hit the gym, remove your makeup if possible to avoid clogged pores. The combination of sweat and makeup can cause excess oil which can lead to breakouts and clogged pores. While working out try your best to avoid touching your face. Exercise machines, yoga mats, and the like are a breeding ground for bacteria and dirt. Since most people use styling products in their hair, pulling hair back is best for keeping skin clean and clear. Once you start sweating hair care products can drip down your face, back and neck so wearing a sweatband is a great way to catch dripping sweat and products before it reaches your skin. Cleaning your face ASAP after a workout is a must! Cleansing right away helps to remove dirt, grime and sweat that can cause clogged pores and breakouts (plus, nothing feels better than a cool splash of water after a hot and sweaty workout session). A gentle cleanser is a must too! 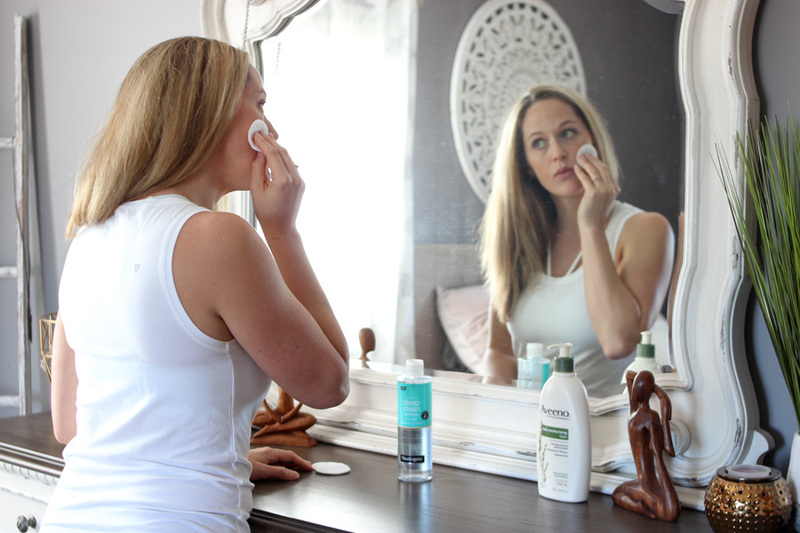 I love using Neutrogena Deep Clean Micellar Water for cleansing post-workout. Micellar water gently removes all grime and even easily removes waterproof mascara (goodbye raccoon eyes!) while gently cleaning and purifying your skin. I gently rinse my face with cool water to start to remove surface dirt and bacteria and follow up with Neutrogena Micellar Water (it deeply cleanses by targeting 100% of impurities). I dab cotton rounds and gently swipe my skin with the micellar water and magically watch as all my makeup and any sweat/dirt easily wipes away! My skin feels so clean, soft and healthy looking since I’ve added this product to my beauty routine. While showering post workout is optimal to remove sweat and grime, if you can’t hop in the shower at least change out of your workout gear ASAP. Keeping on damp and sweaty activewear can be irritating to sensitive skin and cause breakouts and/or clogged pores. Switch into more breathable clothing and if you can’t shower, at least try to wipe your body with towelettes or a wet washcloth to help remove dirt and feel more fresh. While you made have had sweat running down your face, it certainly doesn’t moisturize your skin. After you wash your face/body, use a nourishing lotion to replenish your skin. 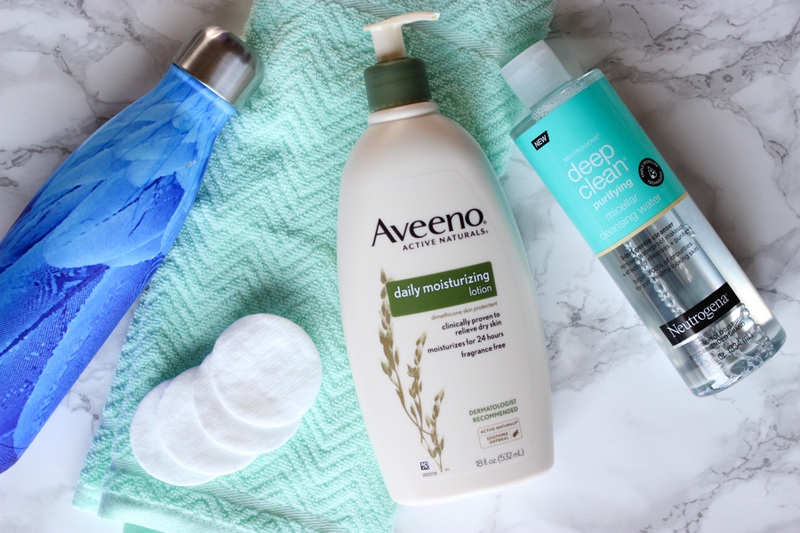 Aveeno Daily Moisturizing Lotion is my lotion of choice because it’s so gentle on skin while leaving it soft and healthier looking. Aveenos fragrance-free, non-greasy and noncomedogenic lotion replenishes moisture lost during a workout without causing clogged pores or irritation. It’s been clinically proven to improve the health of dry skin in 1 day and showed even more significant improvements in 2 weeks. While working out, especially in hot environments like hot yoga or running outside, your body loses a ton of water. Hydrating post workout is absolutely necessary to help your body and skin recover. Electrolyte tabs or drinks are a great option as they can help to rehydrate and replenish lost electrolytes quickly for optimal recovery. Hydralyte Orange Tabs are a perfect option to quickly treat dehydration with up to 75% less sugar and 4x times the electrolytes than leading sports drinks. Simply pop 2 tabs into a glass of water and you’re on the way to healthier skin. Remember to drink continuously before, during and after exercising! 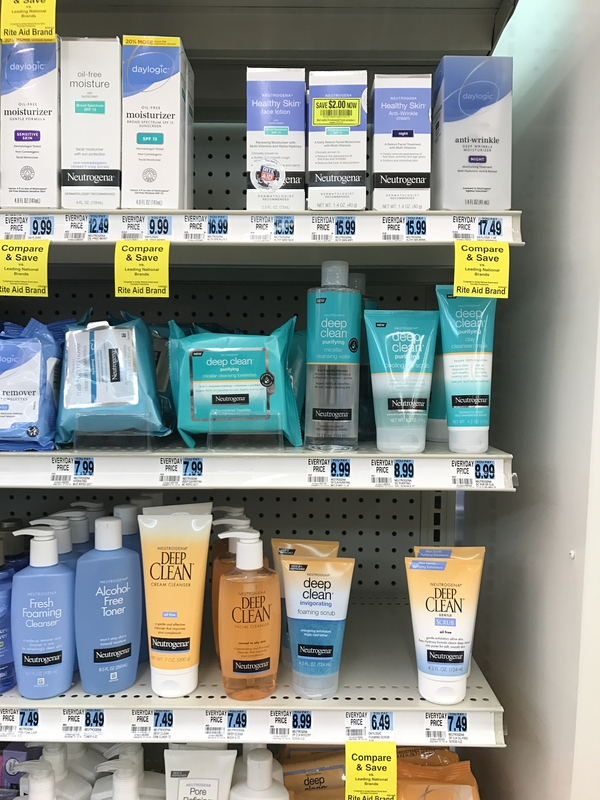 Be sure to check out all the products mentioned above at Rite Aid. 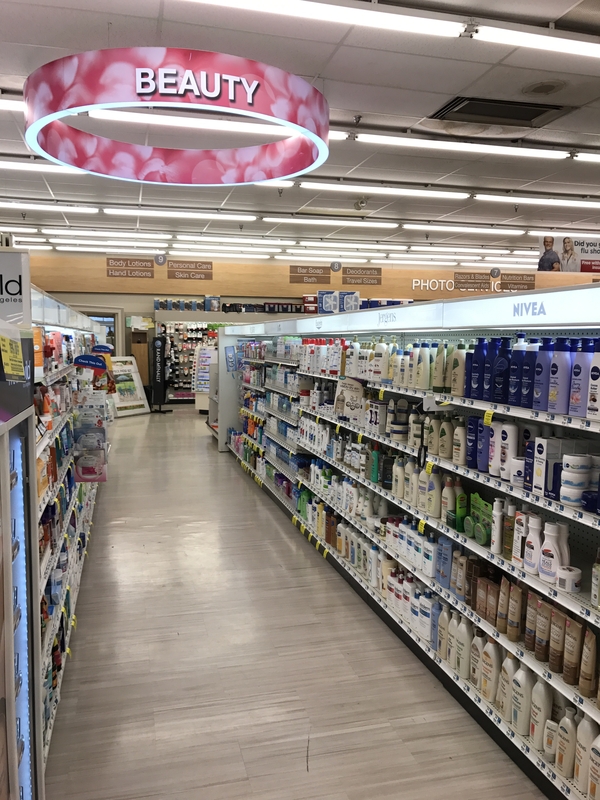 When it comes to wellness and beauty, Rite Aid has your back to help you make smart choices in every aisle and cheer you on in your wellness journey. 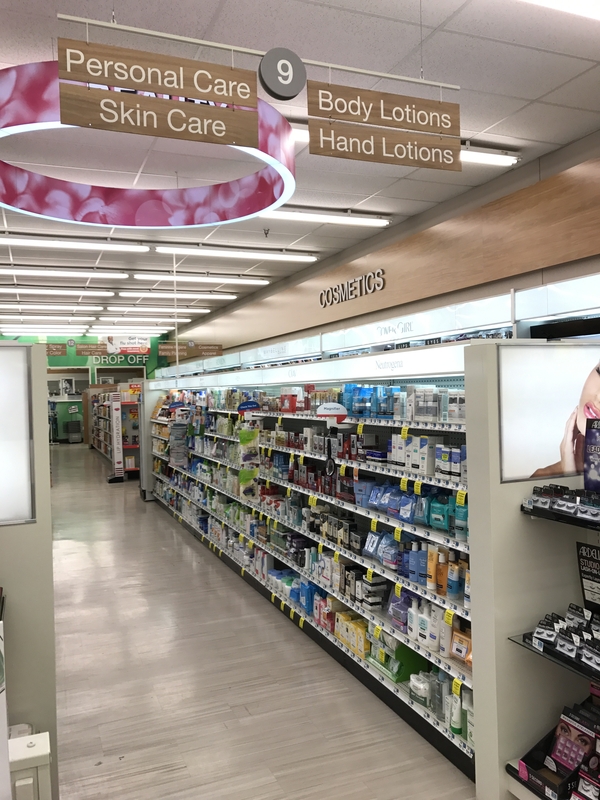 Starting on March 4 thru March 31, 2018, Rite Aid will have some amazing in-store promotions on these items for their Beauty Event! For every $30 you spend, get $10 Bonus Cash on participating Wellness + Beauty items. Find out more about their beauty event and a ton of helpful wellness and beauty tips here! Be sure to take note of their Wellness+Beauty program where each month they have a new theme and solutions to help you succeed (and save) with special offers on products that help you meet your wellness and beauty goals. What’s your favorite way to sweat and move? So many great products for getting the makeup off. It really makes a difference in healthy skin too! Thanks for sharing those great tips that we might take for granted but could help our skin. I love Aveeno. These are such good points when it comes to taking care of your skin. I don’t like the feeling of working out with the feeling of makeup and greasy skin – it really does help when your skin starts out clean! I am so bad about makeup when I work out…I think it’s the Latina in me, always gotta be made up. Guess I should care for my skin better and skip it – thanks for the tips! Great tips for keeping your skin healthy! I am great about moisturizing my face, but am trying to be better about the rest of my skin! I use Micellar water and I feel I must be using the wrong brand. I’ll try Nutrogena instead of L’Oréal. It really dries my skin out and I hate that, Since it does an amazing job removing the makeup. I LOVE using micellar water, really leaves my face clean. I hate greasy workout face! Sign up with your email address to receive exclusive giveaways, news and updates from me!